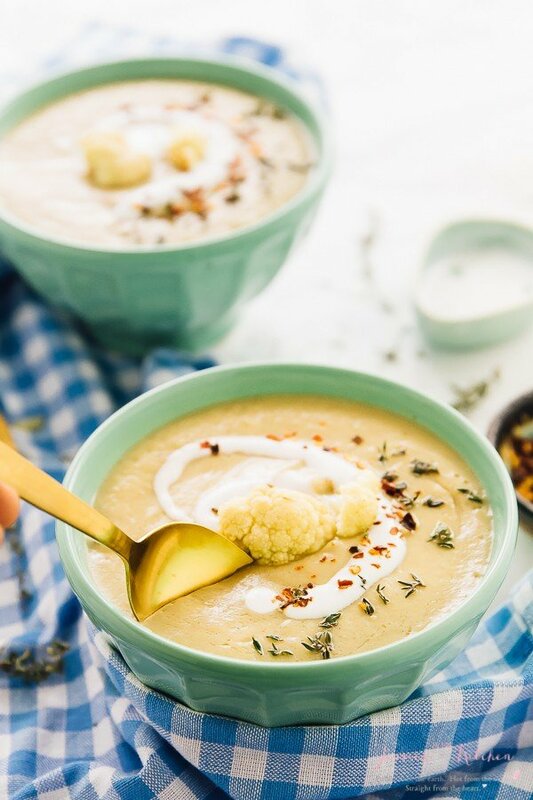 Vegan Butternut Squash and Apple Soup is a thick, creamy and sweet soup topped with a dollop of coconut cream and brimming with fall flavours! I’ve written this introduction over about 5 times. I’m going to try and blast through my writer’s block and get right into this Vegan Butternut Squash and Apple Soup. If you’ve ever had writer’s block, you know how it goes. Funny thing is, it’s not that I don’t want to write. I’ve wanted to share this soup for a few weeks now. but sometimes it’s like hmmm what witty or sarcastically funny joke will I make (you guys do think I’m sarcastically funny right?!) and I get totally lost. ANYWAY. Before I procrastinate from telling you about the soup, this is literally my new favourite soup next to my mom’s pumpkin soup and my carrot soup. Another beautiful accidental vegan soup, this Vegan Butternut Squash and Apple Soup was a sweet one which I think is the first I ever had a sweet soup! Trust me, it’s absolutely delicious. I left mine a little chunky it gave the soup even more body. This is a thick soup which I LOVE. With the coconut cream (refrigerated coconut milk or regular coconut milk) on top, that was seemingly heaven sent. The thyme also goes perfectly with the butternut squash and the apples. When I say sweet, it isn’t overbearing or next to dessert or any of that. It’s more like biting into an apple, only juiced and creamy – does that make any sense at all? Sense or no sense, you’ll definitely love the taste. This Vegan Butternut Squash and Apple Soup would taste great with some croutons or even some toasted bread. Even with a homemade garlic spread to add a beautiful contrast to the sweetness. Speaking of which, I need to whip up some and get right to this again. Add all the ingredients except the coconut milk in a large pot over high heat. Bring to a boil, stirring twice. Reduce the heat to medium low and cook until the butternut squash is fork tender for about 20 minutes. Remove from heat. Remove the thyme with a slotting spoon and using an immersion blender, puree the soup ingredients until combined and smooth. Put the soup back on the stove on medium heat and add the coconut milk and stir. Cook for another 5 minutes. If you try this Vegan Butternut Squash and Apple Soup please let me know in the comment section below, or tag me on instagram with the hashtag #jessicainthekitchen! For more exclusive recipes follow me on Instagram AND on Snapchat: jessinkitchen. Uhh… yeah, I totally hear you on writing intros and stuff for blog posts. There have been times I’ve held off sharing recipes for a month (or two) simply because I had nothing more to say than “This is delicious. Eat this now.” But of course, we can’t just leave it at that, right? In this case though, the soup pretty much speaks for itself because the photos are beautiful and the soup looks beyond delicious! We’re butternut squash soup twins today.. though the recipes are certainly different as mine is not vegan. I love coconut cream though… and often use it when vegan friends come for dinner. And apple is always a wonderful addition to fall soup. Butternut squash soup is one of my favourites, but I never would have thought to put apple in it. Great idea! Such a nice soup to ease into fall with. I just had a butternut squash and apple soup at a restaurant this weekend and was wanting to make it again at home! And boom! It’s like you read my mind 🙂 Looks fantastic! This sounds super duper delish! I love that you used coconut milk to make it vegan. Beautiful photos as well! Your photos always look so bright and happy! Squash and apples? What a creative fall combination!! This soup looks amazing!! Oh yeah, I have had that blog post into writers block too. Happy almost wedding by the way and great soup. I’m off to the supermarket this evening to stock up on apples, ready to sample your tasty recipe. Eeks, I hear ya Jessica, writer’s block is the worst 🙁 I have a bunch of recipes I can ‘t seem to write the posts for lately. I’m glad you shared this soup though! Anything with butternut squash is a winner in my book especially with apples. It looks amazing girl! Oh, Jessica, I get writer’s block ALL THE TIME! Mostly I just sit there until something (anything) comes to me, but it’s tough sometimes, that’s for sure. As for this soup, well, you clearly didn’t get ‘food block’ on the day you made this! I love the idea of the apple and also that the soup has so few ingredients. Pinning this one! I’ve been roasting squash left and right these past couple of weeks. 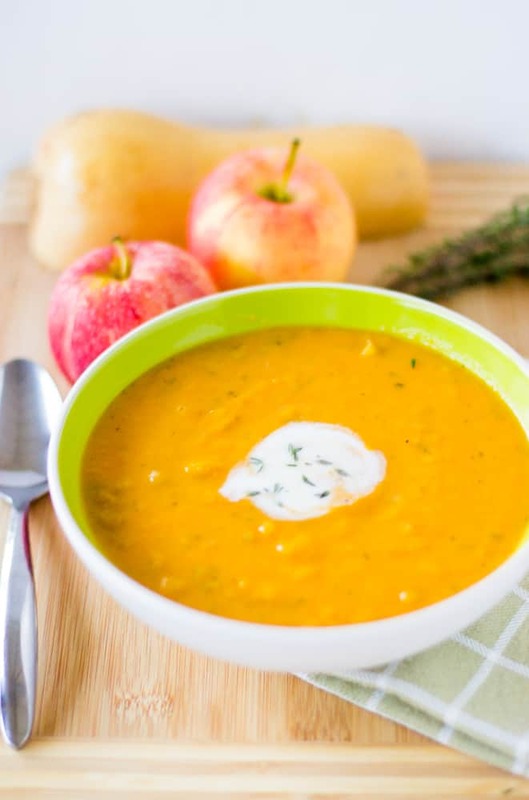 Butternut squash and apple sound like a great combination in a soup. I’m craving a thick soup right now…it’s dark, chilly, and about to rain. Not that I need “atmosphere” to enjoy soup but I could really use a bowl of this! 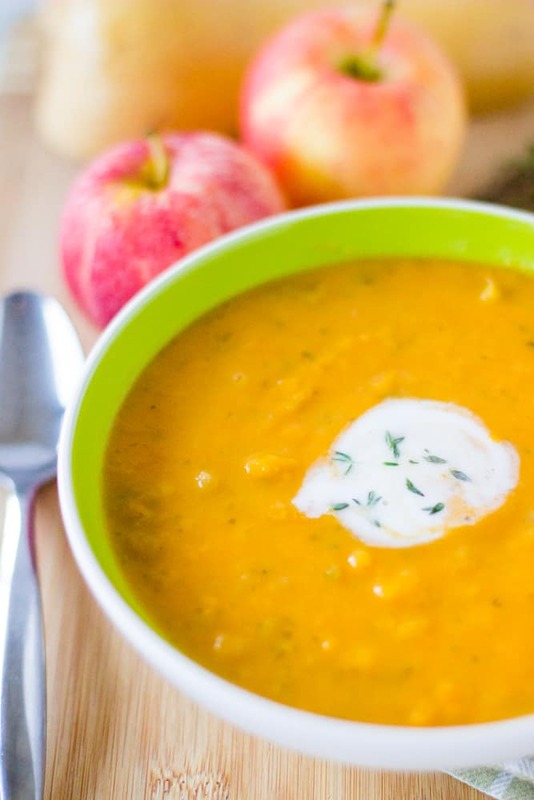 What a simple and delicious fall soup! 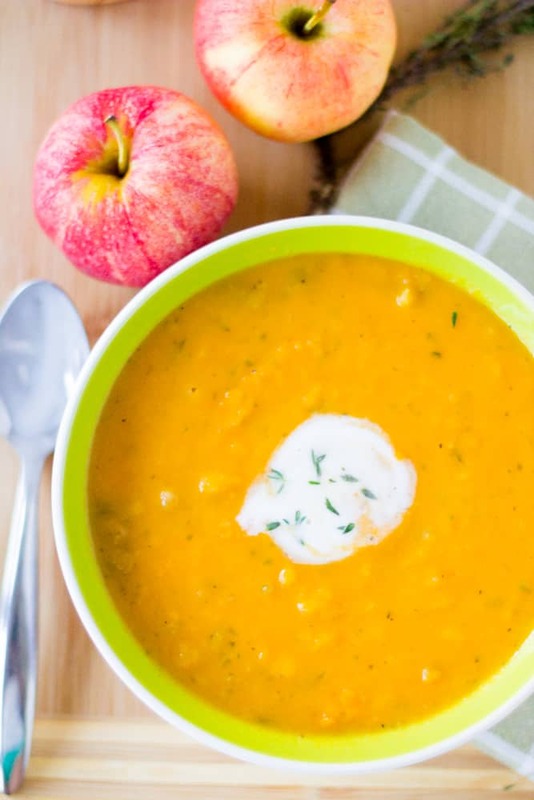 I never add apple in the squash soup but it sounds so delicious! Wow!! This looks amazing and sounds like something I would totally love! I just adore all those festive flavors!! …and this seems like such a good fave next to your mums pumpkin soup!! YUM! Both sound delicious! …and good for you with the good intros… my blog intros are sometimes just terrible. My mums like, Cailee, you can’t always start with, “Happy Monday, Wednesday, Saturday…etc.” hahaha! What a beautiful soup! ! I have never had sweet soup before. But will definitely be trying this soon.. The flavours are so mild and delicate… Delicious! ! I have been so tired lately I feel that I have writers block all the time. I feel as if I avoid posting recipes sometimes because of it. This soup looks and sounds amazing! Love the idea of a sweet soup, so unique! I’m so all about the creamy seasonal soups these days! I’ve been eating a sweet potato soup for the past week, so this butternut squash soup will be a welcome change! Writer’s block is the worst! 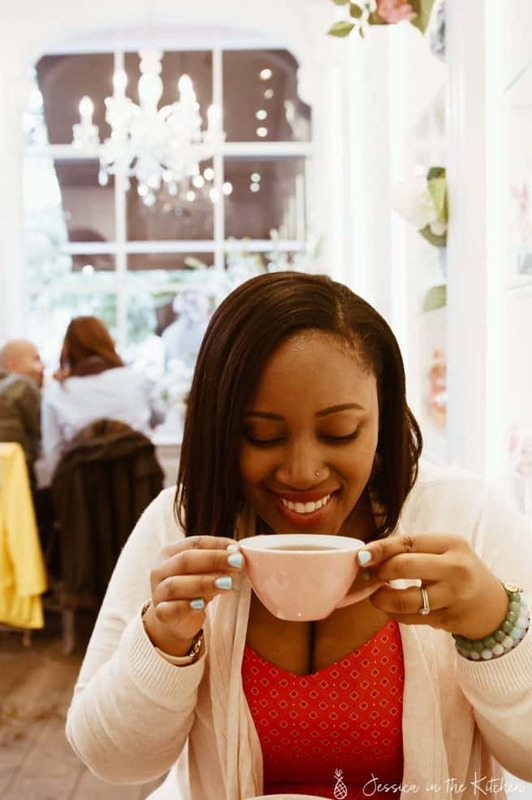 I’ve been swamped at work for the past month which means I haven’t been blogging or visiting anyone else’s blog (that’s why you haven’t seen me comment in so long. I’ve missed you!). In my spare time, I’m too tired to write or bake or cook. We all need a vacation! I’m printing this recipe out, Jess. I LOVE creamy squash soups! Adding the apple and thyme is an amazing idea. This is the perfect cold, dreary night meal. 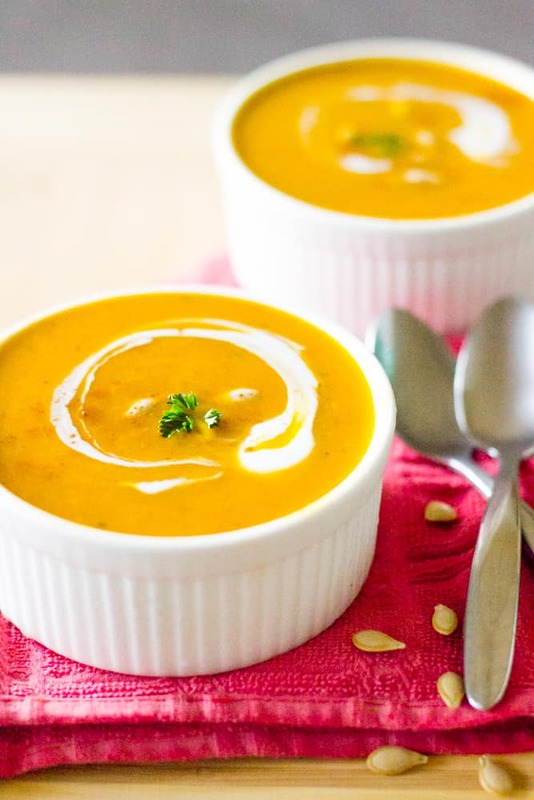 I always have room for more butternut soups in my life! And i love that you paired it with apples and thyme. Super perfect fall flavors. UGH to writer’s block. It happens to me ALL THE TIME. No fun. This soup is lovely. 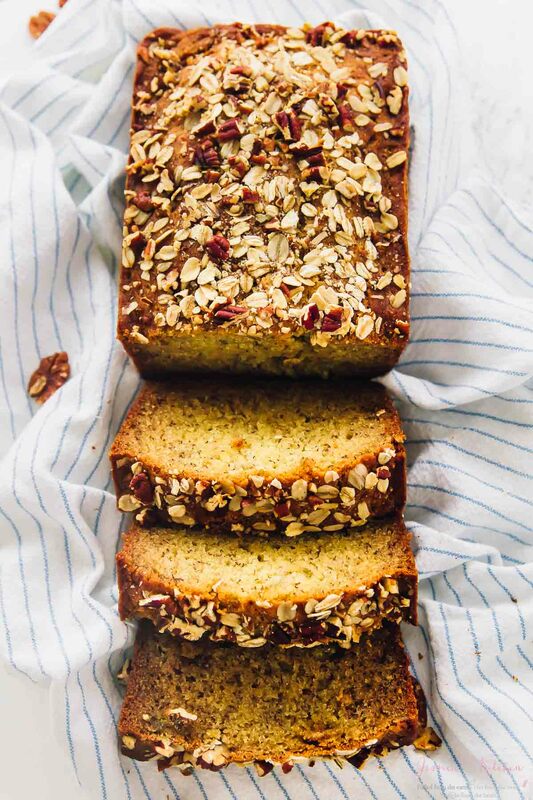 There is beauty in simplicity, especially when you use quality ingredients! I shared a link to your recipe on my blog post about Thanksgiving recipes. Is that ok with you? You have a wonderful blog! Soup is delicious: thank you. I topped each cup of soup with a few fried sage leaves!